I know I've done corset tutorials before. But this one is a bit different. Instead of using a pattern, or making my own pattern, I'm going to use a corset I bought to make a pattern. 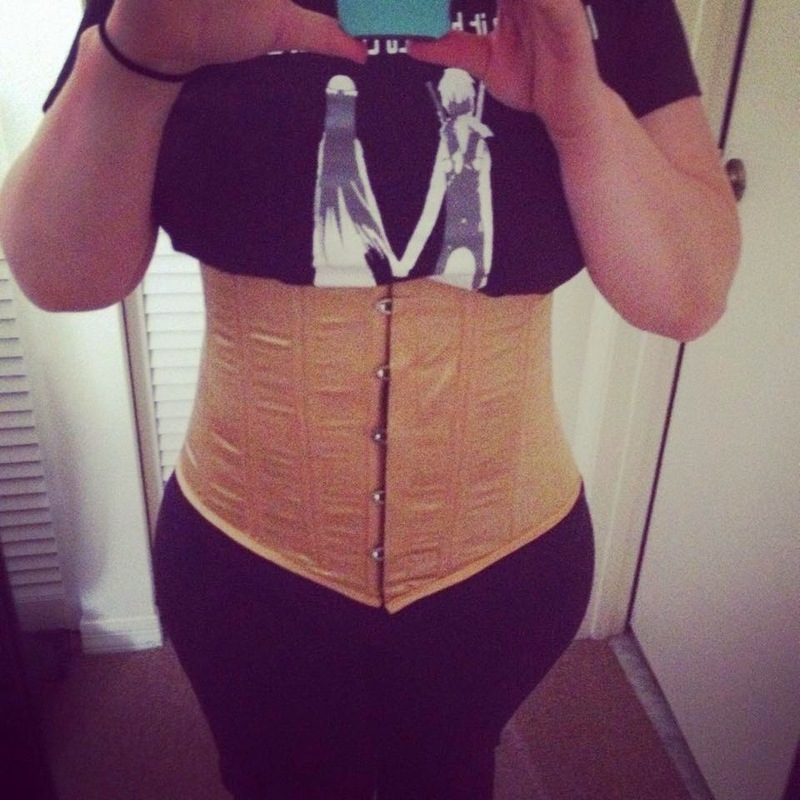 So for this tutorial, you must have a corset that you have purchased and like. The one I used is a bit big for me, as in I can tighten it completely and could easily tighten more. So it does work in shaping, but not as well as I'd like. Start with you corset you bought and lay it out. I use cheap dollar store wax paper to make my patterns with. You can use that, tissue paper, newspaper, any kind of paper really. Lie the paper down on your corset. Start with the front piece (with the busk). Make sure you have plenty of room around the piece to add seam allowances and such. Trace around the first pattern piece. Remove from over the corset and add seam allowances. Like I said before, mine was a little too big, so I decided to skip seam allowances on the sides and only add them to the top and bottom. Repeat with other pieces. Cut out. Make sure you label your pattern pieces with a number. You want to know which piece is which and which way is up. It's best to use your lining fabric with the pattern first before your outside fabric. That way if the pattern doesn't fit, you haven't wasted your expensive outer fabric. If you lining fabric is expensive, use scrap fabric or muslin to create a mock up to make sure everything fits. My pattern pieces to not include the seam allowance, I added it when I cut from the fabric. This is a bad idea, because if you are in a rush, you may skip the allowance. I wasn't thinking when I cut them out. Pin and cut your pattern out of your lining (or muslin). Using chalk or a fabric pencil, mark your fabric with the number so you can keep your pieces in order. What helps me is to line up my fabric with the right side up how it's supposed to look, then fold a piece over and pin to sew. IE, fold 1 over onto 2 so right sides are together. Pin, sew, press. Lie out with the remaining pieces. Fold 2 over onto 3 with right sides together. Pin, sew, press. Repeat. Continue until both sides are pieced together. Test fit. To do this, I clip the front together and wrap it around and just make sure that the gap isn't too large. With a corset, if it's a bit small it's okay because it can be cinched tighter, and it's supposed to be opened in the back. Mainly, you want to make sure it isn't too large. If it fits, it's time to use the outer fabric. After you cut your pattern pieces out, you want to cut them out of interfacing and attach the interfacing to the fabric. Then, sew together as you did the lining. Ignore the pins in this next picture. I started to do my steps out of order. Thankfully, I realized my mistake and stopped. Use a measuring tape and measure your seams. Decrease the measurement by 1" and write down. Make sure to account for both sides. These are your boning lengths. I decided to double bone, so I measured each side of each seam. Also measure the front and back for busk length and lacing bone (if you use them) lengths. Order these materials, if you don't already have them on hand. With right sides together, sew along the front and back. Turn and press. Next, pin along the top. Sew. Wrong sides should be together. Try to match your seams as best you can, but the front looking nice without any bunching is more important than matched seams. Pin along seam line. I like to start from the front and work my way back. That way if there is any bunching, it's in the back, away from the camera that will be photographing me. Sew along these lines. If you do single boned, you need to sew along the seam, and then to one side of it. Make sure you choose the same side for all your seams (ie if you do the side towards the front, do the side towards the front for all of them). If you are doing double boned, like I did, sew along the seam, and then on both sides of the seam. I used 1/4" seam since my boning was 1/4". Now for the busk. Mine was 1/2" wide, so I simply sewed a 1/2" seam along the front. Then, using chalk, I marked where the tabs needed to poke up. I made holes using a seam ripper in the lining of the fabric, because the lining is a sturdier fabric than my outer fabric. For the other side, I did nearly the same thing. Sew a 1/2" seam. Slide the piece in. Mark where the pins are, use seam ripper to create small hole, slide through. If your fabric frays, use fray ease, or something similar. Next, you need to do your lacing bones. Measure them, and sew a corresponding seam along both back edges. Slip lacing bones in. Mark where the holes are. Remove bones. Using a grommet tool, punch holes through fabric. I decided not to use grommets since I'm using lacing bones. Next, slide in all of your bones. Pin and sew the bottom closed. Next, you need some sort of edging. I like to use bias tape, but you could also use a ribbon. I prefer double folded biased tape, but all they had was single fold. I don't like it as well. Place your bias tape across the front, pinning in place. It should be pinned so that it will fold up and over the edge. Make sure to leave excess at both edges. Sew. Fold over. Pin in place and sew to secure, tucking in both ends. Repeat on bottom and other side. Lace it up! I used lacing from a cheapo corset I had lying around. Most boning places also sell lacing, or you can use paracord. Done! Try it on and marvel!